You can save items from your map to Yandex.Disk using one of the supported file types. These files can be used to import map points to navigation programs that allow you to import GPS coordinates. You can also use these files with the Yandex.Maps API or to view and save data in other programs (such as Google Earth). Only information about your map items is saved during exporting. 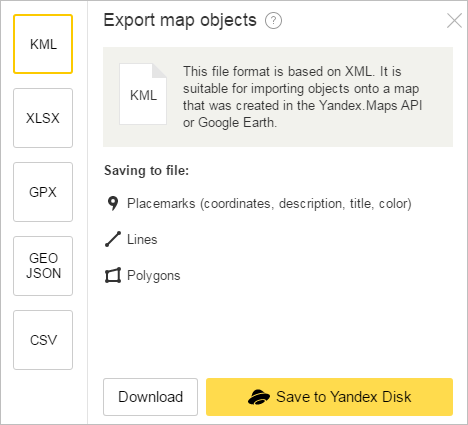 Your map items will be saved to Yandex.Disk in the Map Constructor / Export folder in the file format you chose with the name [Map name + Date + Time]. KML (Keyhole Markup Language): an XML-based format. 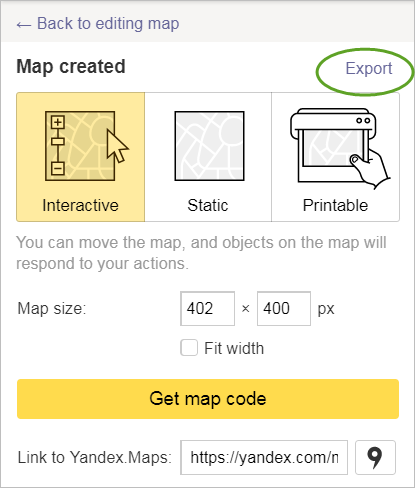 Use this format for importing map items that you created in Map Constructor to a map created using the Yandex.Maps API or Google Earth. This file type saves placemarks (coordinates, description, label and color), lines, and polygons. See Displaying GPX and KML in the Yandex.Maps API documentation for an example of using KML files in the Yandex.Maps API. CSV (Comma-Separated Values): a text format for presenting tabular data. This file type can be opened in text and table editors. Text is divided into columns using special separator characters. To select the separator, click the appropriate Separator button: Comma, Semicolon, or Tab. This file type saves placemarks (coordinates, description, label, number). Coordinates are stored in the order [latitude, longitude]. GPX (GPS eXchange Format): an XML-based text format for storing and exchanging GPS data. It can be used in GPS apps and the Yandex.Maps API (example). For example, you can use it to set routes. This file type saves placemarks and lines (only coordinates for both). GeoJSON: a geo-data format based on JSON. Supported by the Yandex.Maps API, OpenLayers, Leaflet, Bing Maps, and Yahoo! Maps and other cartographic services (example). This file type saves placemarks (coordinates, description, label, number, color), lines (coordinates, description, color) and polygons (coordinates, description, color).